This page describes a usage or software configuration that may not be supported by IBM. This article documents the various steps to add a new field for reporting. It describes, in detail, all the actions to customize the Extract, Transofrm, Load (ETL) in order to populate the data warehouse with the relevant values, and then to update the data model in order to make this field available for new reports in Query Studio and Report Studio. We will illustrate the steps by going through a simple example; adding Requirement Description field. The main intent is to provide understanding of the ETL and data model customization process. Although some notes are included with regards to maintenance, only limited consideration was given to have a maintainable solution. Before attempting these steps, be sure to create a good backup of the data warehouse, data model, XDC files and ETL catalog. NOTE: XDC files, ETL catalog and Data Model will be updated during the next upgrade. This would need to be taken in consideration before upgrading. The out of the box Data Manager ETLs are already configured and working. 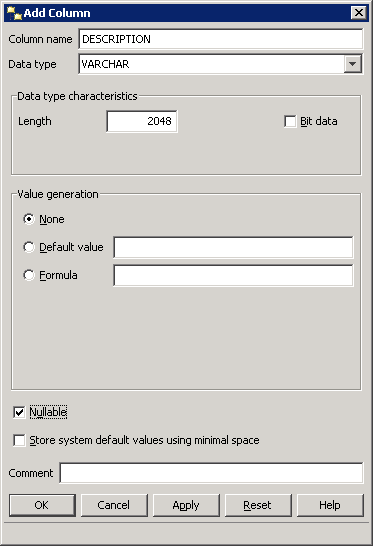 In the out of the box ETL, the requirement data collection is performed through the job RM4.0.5Stg which is enabled by setting the variable STAGING set to TRUE. In this example, the RM_ODS5.0 has variable STAGING set to FALSE in order to call the RM4.0.5_Std Job. We are using DB2 9.7 as a database. The commands may be different if you use a different version or vendor. 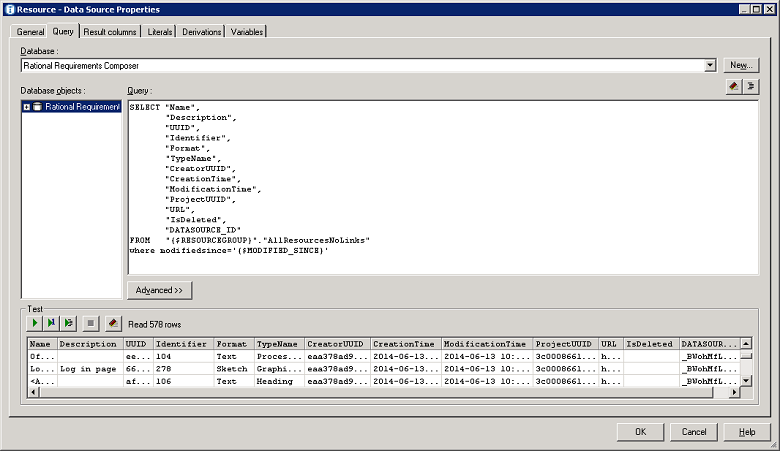 Adding the field to the data model to allow the use to pick this field in report and query studio. In the ETL process, the data is fetched from the CLM applications from Data Manager through their respective REST APIs. However, since Data Manager cannot directly consume XML, the requests to the API have to be transformed into pseudo SQL and the XDC driver will transform it into REST calls. In this example, the first thing we need to do is to open the XDC file used to fetch the IBM Rational DOORS Next Generation (RDNG) data. Open the file rm50.XDC in XML Data Configuration tool. NOTE: You can find out which resource to modify based on the ETL job you want to modify in Data Manager, we will cover this in the Data Manager section below. NOTE: It is recommended that you make a copy of the XDC file before modifying it, or create a new data mapping template. NOTE: If the XML schema is not visible (tree view is greyed out), you may need to change the RRC connection to use Generic XML, and check the box ”Add’ Accepted: application/xml’ to the request. Identify in the XML Schema the field you want to add, for instance, rrm: description. Highlight it and click Create. You can change the Table column name to a more user friendly name. You can also change the length of the field to avoid truncation, the default is 255. Save the XDC file and close the program. Before we go to Data Manager, and go through all the required changes in the ETL flow, we will update the data warehouse to add a new column to insert the new data in. We therefore assume that you have already looked at the ETL in Data Manager and understand which tables are impacted by the change. In a default setup using DB2, the two tables to update are RIODS.REQUIREMENT and RIODS.REQUIREMENT_COLLECTION. In both of them we will add a column, of type varchar, length 2048 (same as the length we defined in the XDC file) and nullable. 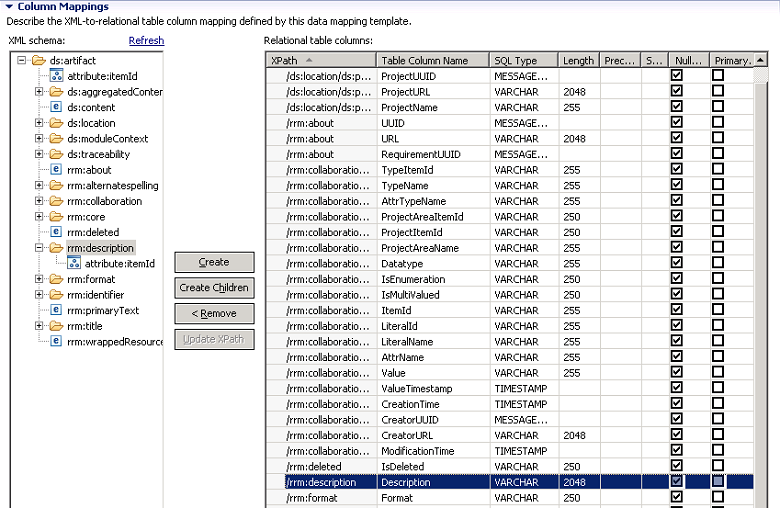 We previously updated the XDC file for ‘Requirement’ and altered the ‘Requirement’ and ‘Requirement_Collection’ tables. The next step will be to test that the XDC returns the expected value. Then include it in the Data Manager fact build relevant to the requirement data collection so it is inserted in the data warehouse table. We will now go through each node of the fact build to propagate the change through the Extract, Transform and Load parts of the build. We go to Data Manager and open the definition of the Fact Build Requirement (RM4.0.3Requirement). In the tree view, click on RationalInsightETL > Builds and JobStreams > ODS > RationalRequirementComposer > RM4.0.3 > RM4.0.3Requirement. If you previously made a copy of the XDC, make sure that the Rational Requirement Composer connection is using the ODBC connection that uses the modified XDC. Once the query has been validated and you see value (where applicable) in the Description Column, switch to the Result columns tab and click Refresh. You will be prompted to enter values for the two variables. Click OK and you should see the Description column being added to the list. Click OK to validate the change in the Resource node. 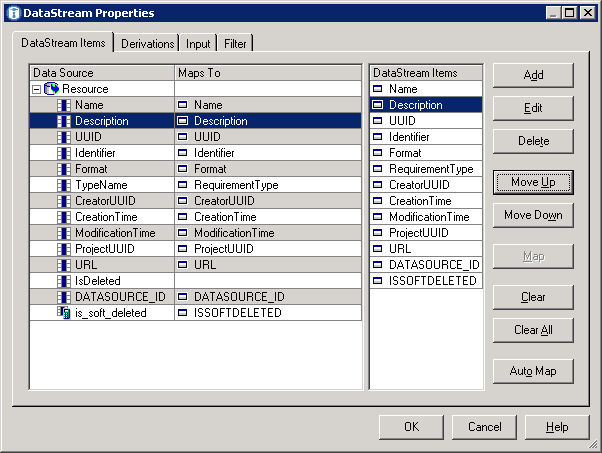 Right click on the DataStream node and select Properties. We see in the Data Source column the new Description entry, however it is not mapped to any DataStream Item. Click OK to validate the change. We now need to add a new ‘Transformation Model’ entry in order to have the DataStream item being delivered to the tables. 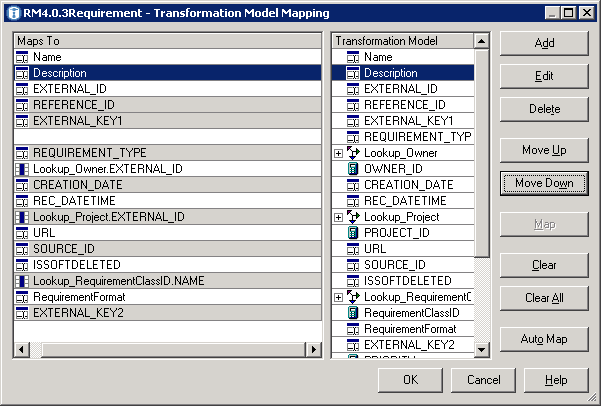 Right click on Transformation Model Node > Mapping. 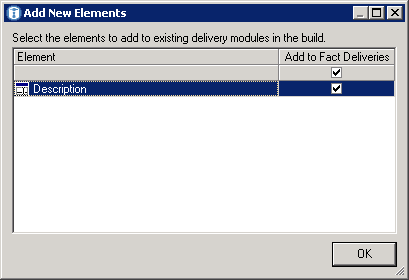 This Fact Build has two delivery modules, one for Requirements and one for Module or Collection. The last action we performed in the transformation model node (add the New Element to the Fact Delivery), created a new entry in both delivery modules. 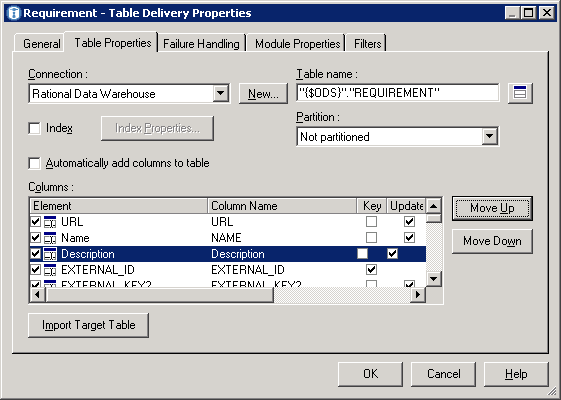 Right click Requirement delivery module node > Properties, switch to the Table properties and click Import Target Table. On the left, select the Description column and on the right, browse to Rational Data Warehouse > RIODS > REQUIREMENT > DESCRIPTION, select this entry and click Map. Since we have now completed the ETL customization, we will run a full load on the requirement build to populate the data warehouse with the change. If the ETL is successful, you can run a query against the data warehouse to verify that the data has been inserted. 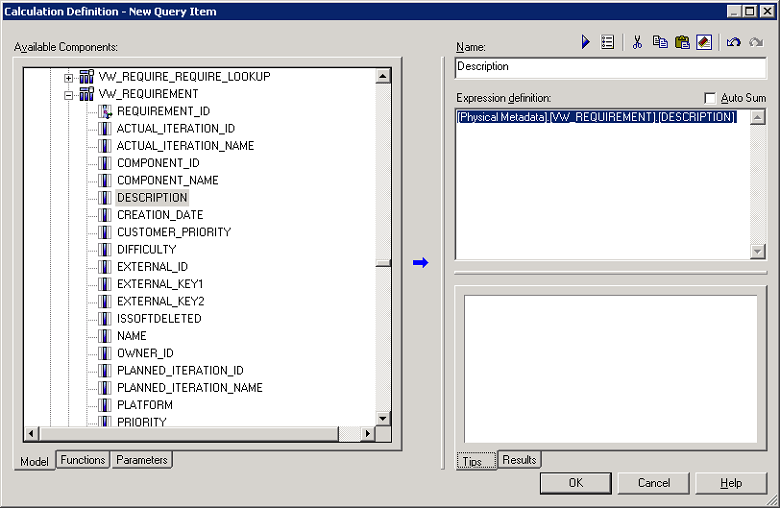 Now that we have the data warehouse populated with the requirement description, we need to change the data model to make it available in Query and Report Studio. This is achieved in Framework Manager. NOTE: In this example, for simplicity’s sake, we will modify the existing objects, however, you may consider to duplicate the data model and views to avoid losing those changes during an upgrade. Depending on your database vendor, the procedure may vary. In this example we use DB2 9.7, the changes are made in Control Center. 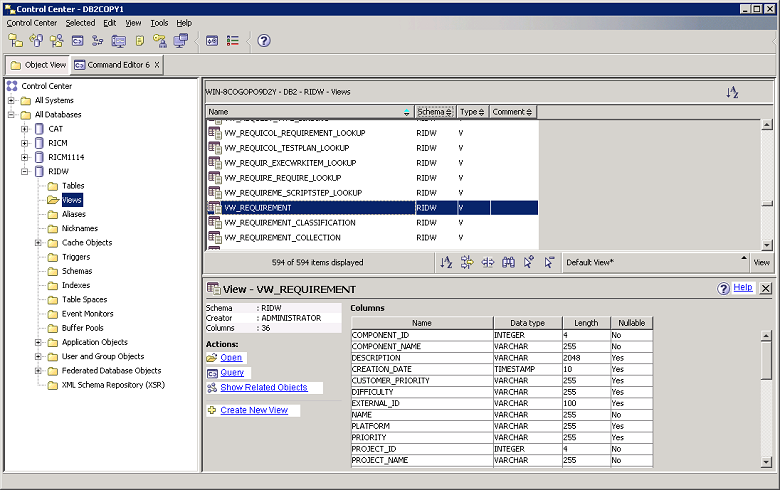 In order to update the VW_REQUIREMENT view, we will get the SQL statement used to create the view, modify it to include the Description field, drop the view and recreate it by executing the modified SQL statement. Make sure the db user used to connect to the data warehouse has the required privileges to access the view. In this example we will only do it for ‘Requirement’ but the same can be done for the requirement collection. Open the data model in Framework Manager (.cpf file) and navigate in the data model to the Physical Metadata > VW_REQUIREMENT, select the node VW_REQUIREMENT and go to Tool > Update object. If you do not wish to overwrite the data model on the report server, you should either rename the package name and the translations that would be used, for instance the package name in Spanish if you deployed the data model in Spanish. Validate all the steps in the wizard and click Publish. Matthieu Leroux is a member of the Software Advisory Team within IBM Rational Support in Amsterdam, The Netherlands. He can be contacted at matthieulrx@nl.ibm.com.